Nearby parks include Horizon Park, Victory Park and Quirk Park. 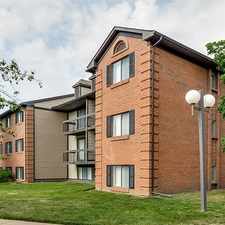 The Parks Of Belleville Apartments has a Walk Score of 39 out of 100. This location is a Car-Dependent neighborhood so most errands require a car. In the center of it all on the Golden Corridor between Ann Arbor and Detroit, Village Green of Belleville is 10 minutes from Detroit Metro Airport and within walking distance to Belleville Lake, a 1,260-acre full sport lake, providing year-round recreation in Van Buren Township. The distinct living spaces feature walk-in closets and fully equipped kitchens in a variety of one- and two-bedroom apartment homes. The beautifully landscaped community also features mature trees and picnic areas throughout and is within minutes of I-94 and I-275. Free morning coffee. 24-hour grand clubhouse with free wireless Internet , Five minutes from Detroit Metro Airport , Billiard room and Sauna(s) , 24-hour emergency on-site maintenance, Internet Library with large selection of books, copy and fax services, Planned monthly social events. Explore how far you can travel by car, bus, bike and foot from The Parks Of Belleville Apartments.